Architects are amazing these days, always revolutionizing every aspect of the house. In this case, it's the kitchen! I found this in an article at Dornob. This cellar can be built anywhere in your home, as long as you can dig a hole. Walking down those stairs must be an experience. It saves space and it'll impress your neighbors; what more can you ask? Another site I StumbleUpon'ed, this site has a grid of images of delicious looking food where you can sort by recipes, food, drinks, etc. It finds recipes from different sources, mainly blogs. It's a great way to find recipes since they always have a great looking picture. Sometimes it's better choosing a book by its cover. Wow, this cellar is amazing. Thanks for the link on taste spotting. 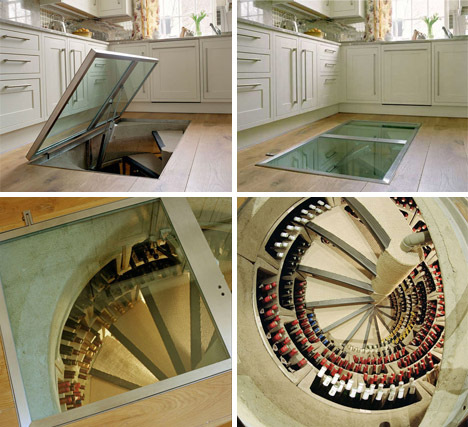 That is the coolest wine cellar i have ever seen!